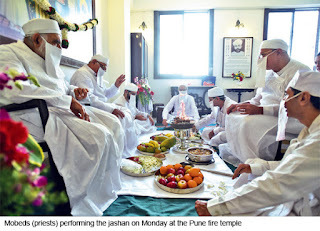 A group of reformist Parsis on Monday raised the banner of revolt against orthodoxy by inaugurating a fire temple in Pune that not only recognises children of Parsis who have married outside the community, but also allows non- Parsis entry. The fire temple, where the eternal fire was lit by ten mobeds (priests), of which two are from Mumbai, has been funded by donors like top lawyer Fali Nariman, corporate head honcho Cyrus Guzdar, former advocate general and senior counsel Darius Khambhata, industrialist Anu Aga and the Pirojshah Godrej Foundation.The Rs 2.5-crore fire temple, located in Pune's Kondhwa area, is likely to stir a controversy and will range the reformists under the umbrella of Association for Revival of Zoroastrianism against the orthodox who have for decades rejected reforms to protect the community's racial purity. The inauguration, marked by a 'jashan' ceremony, was attended by over 100 Parsis and non-Parsis, some of whom were ex-communicated for marrying outside the community. Setideh Irani, 30, attended the opening service with her non-Parsi husband Manish Upadhyay and their nine-month-old daughter. Irani said she felt welcome in the community once again. "I am happy that I will be able to bring back my child and introduce her to my religion. One of the purposes of this fire temple is also to allow people from other faiths to learn about Zoroastrianism," she said. Vispy Wadia, a reformist, said the community is facing extinction because those who have married outside the community are being discriminated against. "We firmly believe that Zoroastrianism is a universal religion. This fire temple will strive to ensure that there is no discrimination. More than being a bold step, it is a progressive step," said Wadia. Wadia said the conflict between the liberals and the traditionalists boiled down to a "non-existent racial purity" which the orthodox have held dear for centuries. "No race is pure or impure. We are pure and impure only by our thoughts. Over 40 per cent of Parsis marry outside the community. This trend seems to have become irreversible now. Even our respected Dasturs and Vada-Dasturs (priests and head priests) have failed to guard their folk as their children have had inter-caste marriages too. It, therefore, makes sense to accept at least children and spouses of Parsis who have married outside the community as the declining population trend cannot be otherwise reversed," said Wadia. The Parsi Zoroastrian population in India is diminishing fast and will diminish faster in the years to come because 35 per cent of Parsis are in the age group of 60 and above. In about 20 years, there will be no more than 20,000 Zoroastrians in India. More than 30 Zoroastrian Anjumans in various towns and villages of Gujarat and Maharashtra are defunct because there are no Zoroastrians left there. Carl Rodin, 22, Emily Rodin, 25, and Yakub Rodin, 18 flew all the way from Norway to be a part of the 'jashan'. Their grandmother Meher Spanberg is a Parsi who married a Christian and thus had to forfeit the right to enter a fire temple. "It is wonderful to be witness to centuries-old traditions and this is our first time in a fire temple. We learnt about the importance of fire, the meaning of worship, and the goodness of this religion," said Emily. Ave Mehta, a Parsi married to a Punjabi, said she had to perform her daughter Aibara's 'navjote' in a private ceremony with the help of a liberal priest. "My daughter is now married to a Parsi," she said. Mehta described the inauguration of the new fire temple as "a momentous occasion and a forward thinking decision to help up the dwindling numbers." Dasturji Khushroo Fali Madon, who worked at the J D Agiary in Colaba for 20 years, headed the 'jashan' ceremony. "If you read the book of five 'gathas' or spiritual hymns composed by Zaratharustra, it mentions that non-Parsis can follow our religion. Unfortunately, our socalled orthodox scholars think otherwise," he said. The new fire temple will perform navjotes of children from inter-racial marriages and solemnise marriages and perform funeral rituals.